RED PHEASANT CREE NATION, SASK. William Boushie, brother of Colten Boushie, speaks to media during a rally outside of the Saskatchewan Provincial Court in North Battleford, Thursday, August 18, 2016. People rally outside a Saskatchewan courthouse Thursday where a farmer accused of fatally shooting a First Nations man is to make an appearance. Debbie Baptiste wanted to look for her son. She wasn't ready to believe he was shot dead after he and his pals stopped in at a farmyard looking for help with a flat tire on an August afternoon. Colten Boushie and his friends went to the river for a dip that day and, around 5:30 p.m., pulled into Gerald Stanley's yard on their way back to the Red Pheasant Cree Nation reserve. A woman was mowing the grass. Mr. Boushie was killed in the yard. RCMP arrested Mr. Stanley. The details leading up to Mr. Boushie's death on Aug. 9 are part of a second-degree murder case that has exposed Saskatchewan's racial divide and heightened the distrust between the province's indigenous citizens and their neighbours. 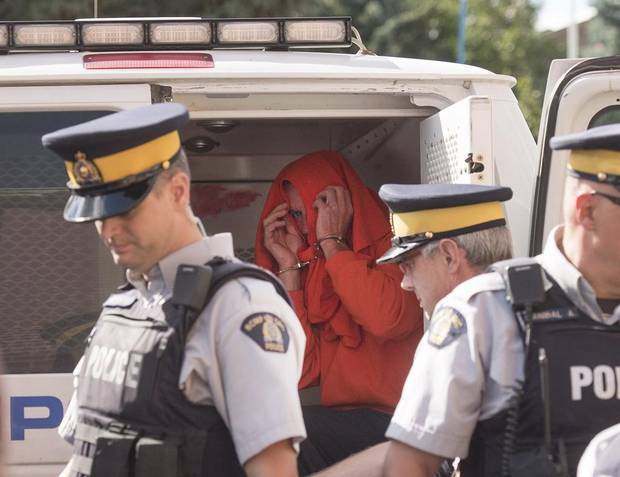 Premier Brad Wall had to call for calm amid a flurry of hate-filled social-media posts after Mr. Stanley was charged with second-degree murder. When RCMP told Ms. Baptiste that her son was dead, she begged her family to come with her, to drive to look for Coco. Mr. Boushie's older brothers called him Coco when they were too young to pronounce his first name. 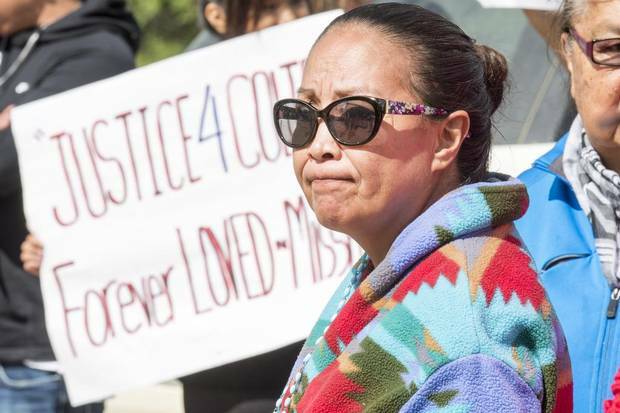 "She kept saying: 'Let's drive around, maybe somebody dropped off Coco out there and we'll find him and bring him home,'" Linda Baptiste, one of Mr. Boushie's aunts, said in an interview outside Red Pheasant's community centre this week. "She wouldn't believe that he was gone. So they drove her around." But to many in the community, the shooting death of Colten Boushie, 22, comes as no surprise. Racial tensions here have been high for decades. 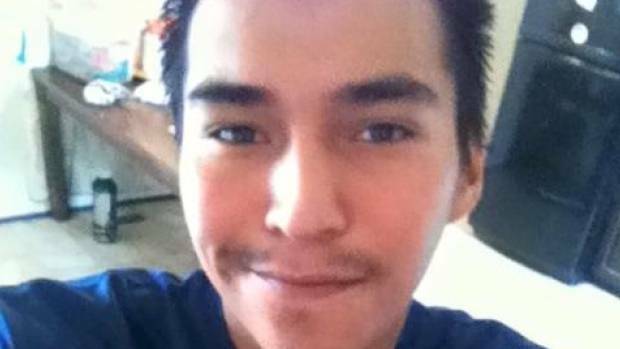 Colten Boushie is shown in this undated Facebook photo. Members of the Red Pheasant community are firm in their belief about what fuelled the shooting. "It is the Mississippi of the north," Marie Baptiste, another member of Mr. Boushie's family, said as band members made signs for a "Justice for Colten" rally. "We shouldn't think that people are going to hurt us because we have melanin." Many in Saskatchewan are not surprised a Cree man died as a result of an alleged shooting in a farmyard. John Nesdoly, who is from Shellbrook, Sask., says there is anger across Saskatchewan's non-indigenous farming communities. Crime waves, Mr. Nesdoly said, stoke the hostility toward First Nations. "It is overdue," he said. "I'm surprised there hasn't been a lot more of them." "The First Nations come on to our property and they steal," he said. "They don't work, they are always looking for handouts." Asked for evidence to back up the claim indigenous people are responsible for waves of thefts, Mr. Nesdoly said: "The stolen property is usually found on a First Nations reserve, trashed. Ninety-nine times out of 100, that's usually the case." "The perception that they got, they earned." Mr. Nesdoly, who does not live around the area where Mr. Boushie was killed, believes it is possible he would do what Mr. Stanley is alleged to have done. "I can very easily be that very same situation," Mr. Nesdoly said. "If I was threatened in any way, shape, or form, I would probably do the same thing, actually. I don't know if I would shoot to kill. But you never know. You're not in that situation, you don't know." Gerald Stanley leaves in custody after his bail hearing on Thursday, Aug. 18. It is not yet known whether the Stanleys were threatened. Mr. Stanley pleaded not guilty in a North Battleford courtroom Thursday. The stereotype that band members are thieves and vandals puts all indigenous citizens at risk, Marie Baptiste argued. "In a way it didn't surprise me that somebody got killed over other people's wrongdoings … It is just that they think that just because this is another native coming into the yard that they are not going to ask for help. It is an automatic assumption that they are there to steal from them." Those off reserve struggle to see First Nations as potential lawyers, doctors, and pipefitters, she said. "They think that we're all bums and we're all on welfare and we're never going to amount to anything." A judge on Friday granted Mr. Stanley bail, with a string of conditions attached. He must deposit $10,000 to Court of Queen's Bench; enroll in the electronic monitoring program; not possess any firearms, crossbow or other weapons. Division No. 12 includes 37 communities, of which there are 31 towns, villages and rural municipalities and six First Nations reserves. Division No. 12 is one of 18 census divisions in Saskatchewan defined by Statistics Canada. Census data is unavailable for Grizzly Bear’s Head 110 and Lean Man 111 and Sweetgrass 113-M16. Percentage of the population over age 15 who have not completed high school nor any postsecondary certificates, diplomas or degrees. The accused must stay within a four-mile radius of his house 24 hours a day, unless granted special permission, and he must not travel within a 20-mile radius of the Red Pheasant reserve, save for emergencies. Other conditions include having no contact – either directly or indirectly – with Mr. Boushie's family and any witnesses, save for his son and wife. He must also check in with a probation officer. The Stanleys live in the rural municipality of Glenside, near Red Pheasant and other reserves. It is about halfway between the city of North Battleford and the town Biggar. They have plenty of supporters, including those who donated money to help cover their legal fees. "These dirty Indians off the Rez stopped in at our farm and tried to steal our vehicles and when they couldn't, they vandalized it," one person wrote on a GoFundMe page for the Stanley family that has since been removed. "After our farm pitstop, they carried on to Gerrys where things got out of hand." Red Pheasant, like many indigenous communities across Canada, is poorer, has less education and suffers a higher unemployment rate compared with its surrounding communities. Statistics Canada's 2011 National Household Survey reflects the stark differences: 43 per cent of Red Pheasant residents were unemployed, compared with 6.7 per cent in its entire census division; household income on the reserve in 2010 was $19,091, compared with $60,434 everywhere else; and a large swath of the reserve's residents lack education. Saskatchewan has the highest rate of aboriginals in correctional services, at about 74 per cent, despite representing only 12 per cent of the adult population. 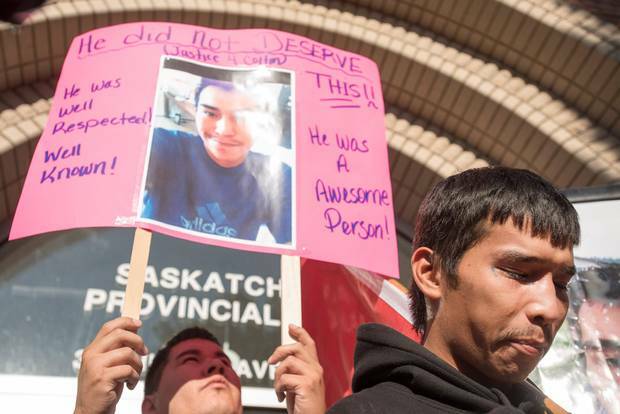 These types of statistics underlie Saskatchewan's racial tensions. Depending on the vantage point, the numbers justify the covertly racist suggestion that aboriginal citizens are more likely to commit crime and work little; or they reflect the institutional bias toward indigenous residents. Indeed, the Federation of Sovereign Indigenous Nations condemned the first RCMP press release regarding Mr. Boushie's shooting, saying it "provided just enough prejudicial information for the average reader to draw their own conclusions that the shooting was somehow justified." The RCMP's release noted the "property owners" did not know the people who arrived in the vehicle; that a "verbal exchange occurred in an attempt to get the vehicle to leave the yard"; and that three of the vehicle's occupants were taken into custody "as part of a related theft investigation." The RCMP added they were looking for another unknown male. The Mounties have not laid charges against anyone other than Mr. Stanley. Residents around Biggar are also frustrated with the authorities, accusing the RCMP of not doing enough to deter and investigate crime. The RCMP declined to comment on allegations it takes a lax approach to policing rural areas such as Biggar, noting the circumstances in every incident vary. Even the National Farmers Union issued a statement as vitriol toward First Nations bubbled online, saying "we condemn the rampant racist remarks that have circulated." Debbie Baptiste, mother of Colten Boushie, looks on during a rally outside of court during Gerald Stanley’s bail hearing. "We also commit ourselves to building relationships of solidarity, mutual respect and friendship with our indigenous neighbours and to honour our obligations as treaty people." Mr. Boushie, who grew up in the United States and had dual citizenship, wanted to be a firefighter. At wakes, he made sure ceremonial fires burned through the night. On Facebook, he put out calls for work, asking whether people needed their lawns mowed or yards tidied. He mourned his mother's Chihuahua when it died. "Damn poor bella," he wrote on Facebook in July. His Facebook page also shows hints of a young man with troubles. "Back in the saddle again, throw my middle finger up to the law ain't gotta rob nobody tonight but I do it just because I'm a nut i get bored did some pills but I want more," he wrote on April 29, quoting singer Yelawolf. Mr. Stanley, 54, next appears in court Sept. 13. The atmosphere in and around his court appearances is tense. Mounties escorted his family through the crowd of peaceful supporters of Mr. Boushie on Thursday. "Native lives matter," one sign read. RCMP members from other detachments were brought in to keep the calm. Only a handful of supporters showed anger when Mr. Stanley's family left the courthouse Thursday morning. "Murder is murder," one yelled. Thursday marked the first time Mr. Boushie's allies saw Mr. Stanley's face. It was important to them, they said. Band members wanted the accused's face on TV and in the papers, like so many of their brothers and sisters who have been put on display. They crowded around the backdoor of the courthouse in Battleford after Mr. Stanley's bail hearing to see him escorted out by Mounties into a waiting RCMP van. "Justice for Colten," they chanted as soon as he appeared, trying to hide his face under orange cloth. "Justice for Colten." Editor's note: A quote on Mr. Boushie's Facebook page was wrongly attributed to Mr. Boushie. In fact Mr. Boushie was quoting hip-hop artist Yelawolf. This is the corrected version.